Disney by Enesco: Collectable Figurines Showcase & Review + Win a Belle Masquerade Figurine! I’m really excited to be showcasing and reviewing several collectable figurines from Disney by Enesco, including Disney Traditions, Disney Enchanting, and Disney Showcase. The different collections feature many beloved Disney characters, but I wanted to focus on Disney Princesses. (The live action version of Beauty & The Beast is released in March 2017.) So I’ll be sharing some of my favourite Princesses (official ones, and not so official!) with you in this post. Enesco have also kindly provided a Disney Showcase Haute-Couture Belle Masquerade figurine for me to giveaway! Keep reading to find out how to enter! If you are new to my blog you won’t know that I love all things Disney, and have several collections of various Disney merchandise. Of course, if you’re a regular reader, you will know this! 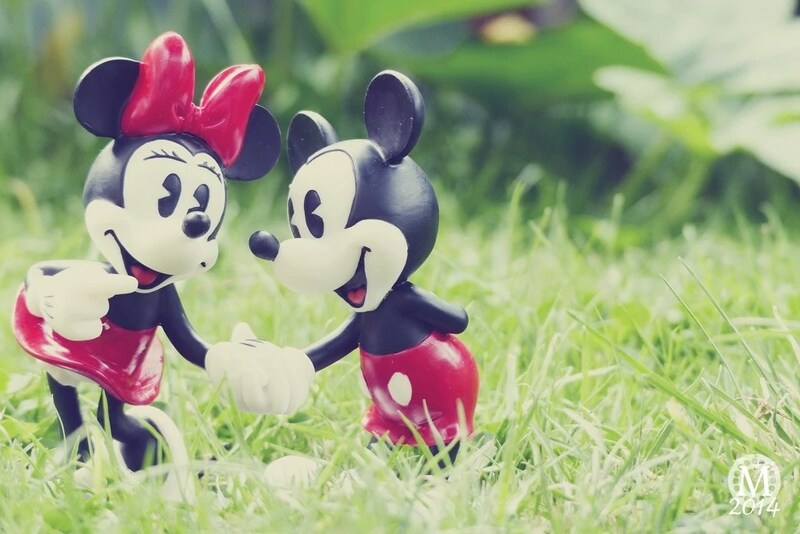 My figurine collection started when my husband bought me this Disney Enchanting Mickey & Minnie figurine, entitled Always By Your Side for our 5th wedding anniversary. I absolutely love it! The Disney figurines that I’m showcasing are all made from resin, hand painted (so unique variations are to be expected) and packed in a branded gift box. They are not a toy or children’s product. Intended for adults only. They make wonderful gifts for loved ones, or as a gift to yourself! With so many different styles and characters, it is easy to become enthralled, and find yourself becoming a collector! I was sent five different figurines to review, across the three collections showcased in this post. A magical collection by award-winning artist Jim Shore, who combines much-loved characters from Disney films with American folk art-inspired patterns and bold colours, in a style that is unique and instantly recognisable. Disney Traditions was launched in 2006. Featuring all of Disney’s classics such as Snow White, Tinker Bell and Fantasia to new Disney characters from much-loved Disney films, including: Tangled, The Lion King and of course, Frozen. These magical characters are depicted in a number of formats including figurines, waterballs, musicals and hanging ornaments, perfect as a gift or an addition to your collection. My favourite Disney Princess has always been Princess Aurora – or more commonly known as Sleeping Beauty. The Disney Traditions figurine of Aurora is called Wonder and Wisdom, and features her holding the tiny Blue Fairy – Merryweather – in her hand – I’m not sure which one is imparting their wisdom! This figurine stands at 18cm. Aurora stands upon a platform, in her pink dress (which I’m pretty sure Merryweather isn’t happy about!). As with all the pieces that I received from Enesco, the attention to detail is wonderful, and I love that each one is slightly unique because they are all handpainted. Growing up, one of my favourite Disney movies was Robin Hood. Maid Marian isn’t an official Disney Princess, but she is the cousin of the King Richard, so she is a Princess! Anyway, I don’t often see merchandise from this movie, so to have a Disney Traditions figurine from it, just makes my day. Just like Aurora, Marian is standing on a platform, but is slightly shorter at 16cm. I love her sweet smile, and bushy tail poking out from the back of the dress. This Disney Traditions is called Merry Maiden, and there is accompanying statues for Robin Hood, and Prince John with Sir Hiss. And my third review piece from the Disney Traditions Collection – Dreaming Under The Sea. Ariel is lying on rock, with her bright red hair billowing out behind her. Her sidekicks Flounder, and Sebastian the Crab accompany her in this piece. Like the others, the attention to detail is fantastic, and I love that these feel sturdy, but are lightweight. Ariel and her friends is 16cm high, and 18cm wide. I’ve chosen several more Princess figurines from Disney Traditions which listed, and pictured below. In my favourite show at Walt Disney World – Dream Along with Mickey – Mickey Mouse says to Minnie that she will always be a Princess to him ♥ and that is why she is included here too! At a whopping 57cm tall, you can see why she is a statement figurine! Midnight at the Ball (Cinderella) is one of several other Princesses who have their castle painted on the front of the dress. I love that the figurine is called Happily Every After, for Snow White and her Prince Charming. Both Tiana and Pocahontas are kneeling down with their small animal sidekicks, which I find really endearing. There is also a Rapunzel one in this style too. Finally, the sisters from Frozen – Act of Love, which is a Storybook piece, with a memorable quote from the film – Only an act of true love will thaw a frozen heart. This would make a beautiful gift from one sister to another. The Disney Enchanting Collection features classic Disney characters from Mickey Mouse through to Frozen, all developed here in the UK. Introduced in 2012 this collection brings together a host of classic characters such as Mickey, Donald, Tinker Bell, a range of your Disney favourites as well the Disney Princesses and not forgetting the villains. Characters and scenes are beautifully immortalised with this wonderful series of imaginatively modelled figurines capturing the magical charm of each Disney character. From the Enchanting collection is this very sweet musical Belle called Tale as Old as Time. Standing 13.5cm high; Belle is dressed in her iconic yellow gold dress, and elegantly spins around to the signature song from Beauty and The Beast. The wind up key is at the bottom, and the tune lasts for around 30 seconds. I have filmed a little Instagram video so that you can hear it. Check it out here. My favourite picks from this collection are listed below, including the product number, name, characters, and SRP. I mentioned at the top of this post that my selection was Disney Princesses – official ones and not so official. I adore Marie from The Aristocats, and so, she makes my unofficial Disney Princess list! The Disney Showcase Collection is exactly that – a showcase of all of the best-loved characters from the timeless, magical world of Disney. The Haute Couture figurine collection demonstrates its glamorous credentials with a new series of Disney Princesses dressed in the lavish styles and rich colours of the Art Deco era. My final piece to review is Rapunzel. Of the modern day Princesses, she is one of my favourites – she is so determined and feisty! Her hair is amazing of course, but when she gets it braided, it looks so pretty! I love that the Rapunzel figurine from the Disney Showcase Collection has her hair tied back and adorned with lots of lovely flowers. She has the sun emblem on her necklace and bracelet, and along the front opening of her dress are tiny little gemstones. From the photo, it looks like she might be precariously balancing on her tip toes, but rest assured there is a stable base underneath and hidden from view. She stands at 20.5cm tall. All of the Disney figurines come packed well in moulded polystyrene, and cardboard box for safe keeping when not on display or for things like moving house; and of course for staying protected during delivery/transit. Once again, I’ll mention that these are collectable pieces, rather than toys. They are intended for adults, but I would say if you have responsible tweens and teens, these would make gorgeous keepsake gifts for them too. The final figurine I’m showcasing from this collection is the Belle Masquerade Figurine. Belle’s dress is very pretty with the roses on the bodice, and trailing down the skirt; and I love that her mask resembles the red rose too. There are other [un] masked figurines in this collection, including The Beast, Tinkerbell, Maleficent, Tiana, and Alice in Wonderland. If you have fallen in love with the Belle Masquerade figurine, keep scrolling because I’ve got the chance for you to win her for your very own! You can check out other Disney figurines and where to buy them here. Leave a comment on this blog post answering the following: Who is your favourite Disney Princess (official or not!) Please note that comments are held in moderation until approved. Leaving the above blog comment is mandatory. All other entry methods are optional. This giveaway uses Rafflecopter – follow the prompts in the widget below; you may have to refresh for it to appear. Check out this handy guide on how to use Rafflecopter if you’ve never used it before. Terms & Conditions for this giveaway can be found at the end of this post, as well as on the Rafflecopter widget. By taking part in this giveaway all participants will be deemed to have accepted and be bound by these terms and conditions. This giveaway starts on 23rd January 2017 and ends at midnight on 6th February 2017 (GMT). The prize is a Disney Showcase Haute-Couture Belle Masquerade Figurine (1 Prize total). Winner will be drawn at random at the end of the promotion. Other entry methods are optional. All entries are checked. Incorrect entries will be removed. The winner will be drawn and notified by email within 28 days of the closing date. Winners are generated randomly via Rafflecopter using Random.org. Please ensure that you type your email correctly when entering and add michelle@thepurplepumpkinblog.co.uk to your safe sender list. If after a reasonable amount of time (28 days), the winner hasn’t made contact with the giveaway promoter, the winner will be declared void and a new winner will be drawn. You will have to provide your name, address, phone number and email address which will be passed to the prize sponsors (Enesco) for delivery of the prize. Delivery is usually within 3/4 days after dispatch, but please allow up to 28 [working] days for delivery. Please contact Michelle at The Purple Pumpkin Blog if you have any questions about this giveaway or these Terms & Conditions.